Graphic © Connie G. Barwick, licensed to The Spruce. Have you ever looked at a cross stitch pattern and wondered what the symbols meant? Sometimes it is as simple as identifying a specific color, but other times it may be a stitch or several stitches in one square. What does the designer want you do to? Is is a misprint? The tutorial below will explain what the symbols mean. Once you know how to read this type of symbol on the pattern, you will be on your way to cross stitch greatness. What Do Two Symbols in a Square Indicate on a Cross Stitch Pattern? One question frequently asked by new stitchers is, "What does it mean when I see two symbols in a square on a Cross Stitch pattern with a black line between them?" You now know that the symbol means a quarter stitch but just what is a quarter stitch and how do you do it. Quarter stitches are just as the name implies; a quarter of a stitch. The stitches should be oriented from the corner of the square to the center, as shown in the image above. You have the quarter stitch, half stitch and back stitch down and know how to recognize those on your pattern. 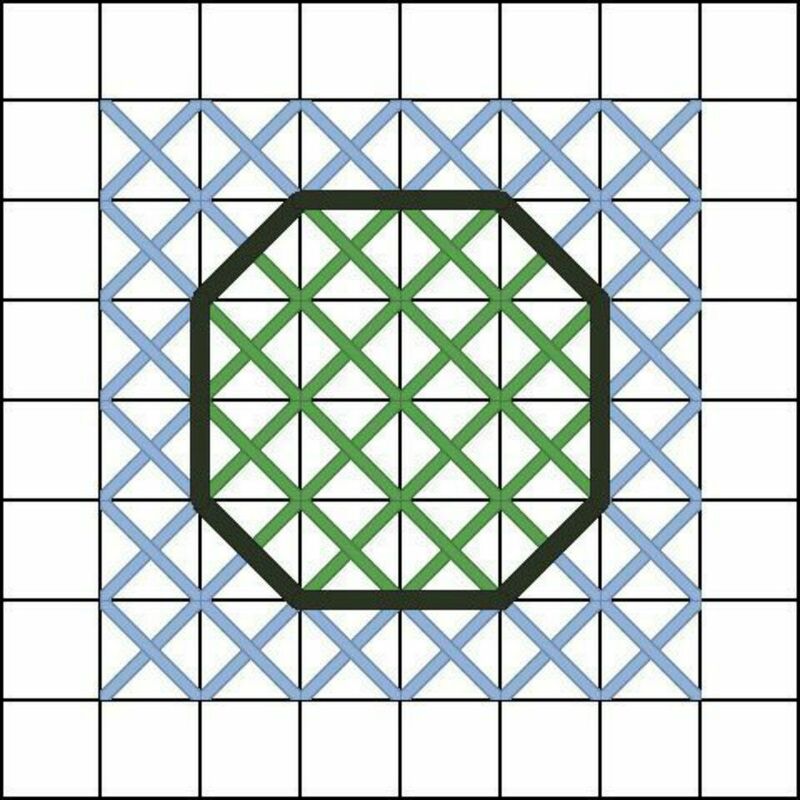 As you can see in this image, there are several squares with two symbols. Are you now more confused than before? Don't worry! It is just as easy to understand this symbol too. For this pattern, the black lines indicate stitching back stitches. The pattern key should be clear about the correct color for the back stitches. Remember to read your pattern and see what they are using for symbols for stitching and color. If the pattern key does not give specific directions about the color of the back stitch (or the half stitch in other cases), then you must use your judgement. Generally, the dominant color is the best choice. In this example, The ball is the dominant image. The back stitch should be done in the color indicated by the + symbol. In this case, that color is green. 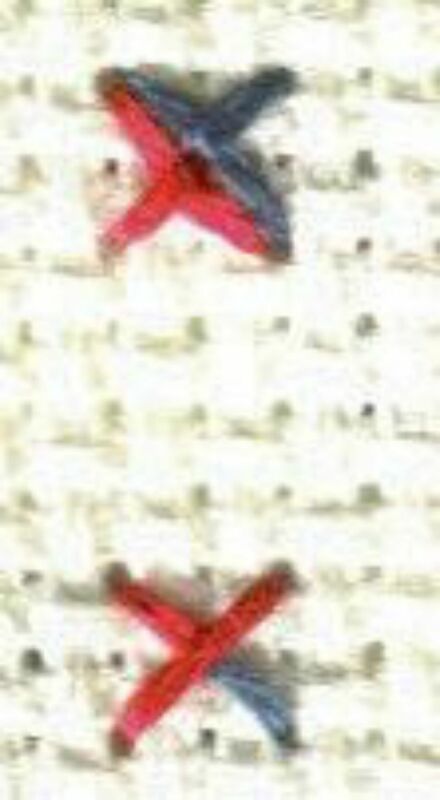 This image shows the small motif as it would appear when stitched.You can here the mix of color representing different stitches and colors. This is a somewhat easier way to tell what your stitching will look like and what you need to do. It is an excellent way to teach beginners about symbols. When two symbols in a square are separated by a line, it may also mean that you should stitch two three-quarter stitches side-by-side. To do this, the quarter stitch must be placed over the top of the half stitch. This ensures that the stitches will fit in the square. This may seem confusing but it allows you give your project more depth and movement instead of stiff lines. Three-Quarter Stitches may be constructed with the half stitch on top or the quarter stitch on top. The stitch on the left has the quarter stitch placed over the half stitch. This creates a slight curve in the half stitch. The stitch on the right has the half stitch on top. The upper stitches are side-by-side three-quarter stitches. The lower stitches are a three-quarter stitch and a half stitch. You can see in this example the color contrast of each stitch and how it will allow the piece to flow.